Doctors and patients need to be realistic about weight loss goals. Doctors and patients need to be realistic about weight loss progress. Honest communication is vital if you expect your doctor to help you lose weight. In this article I found on MSNBC, Karen Rowan writes about a new study that shows doctors who are overly optimistic about a patients weight loss do not really help their patients succeed. It’s important for doctors to be supportive to their patients but too much optimism can set people up for failure. When a doctor overestimates the patients likelihood of following their directions, the doctor becomes dismayed, then the patient feels like a failure when the weight doesn’t come off. Motivated to stick to the weight loss plan begins to wane and often patients give up. If you want to know whether you’ll lose weight or not, don’t ask a doctor.In a new study, physicians predicted about 55 percent of patients would be “likely” or “very likely” to follow their recommendations for losing weight, eating healthier or getting more exercise. But three months later, only 28 percent of patients had lost at least two pounds, 34 percent were eating less fat and more fiber, and 6 percent were getting in one more hour of brisk walking each week. Recordings of doctor’s appointments More than 60 percent of Americans are overweight or obese, according to the Centers for Disease Control and Prevention. In the study, the researchers made audio recordings of conversations between 40 doctors and 461 of their overweight or obese patients. The doctors and patients knew their conversations were being recorded, but were told only that the study they were participating in would look at how doctors “addressed disease prevention” with their patients — not that weight loss goals would be looked at, specifically. After each visit, physicians were asked questions such as: How likely will the patient follow your weight loss recommendations?When considering the patients who the doctors said would likely improve, most of the time, the docs got it wrong. Only 16 percent of those predicted to lose weight actually lost weight over the next three months. Of those that the doctors predicted would follow their healthy eating recommendations, only 19 percent actually improved their eating habits. Four percent of those predicted to get more exercise actually started doing so.The physicians were more often accurate in their guesses about who not improve. Is optimism good? Doctors’ expectations about their patients ability to change is important, because a doctor with low expectations “can lead to patients being less likely to improve their behaviors,” the researchers said. When patients don’t improve behaviors, doctors’ expectations only sink even lower, and a vicious cycle ensues. This doesn’t always have to be a negative thing however. Knowing this kind of information is actually a positive thing for some. Some people after reading this might say to themselves “I’m determined not to be one of the negative statistics. Doctors and patients need to be realistic about weight loss and try to communicate honestly with each other. Weight loss supplements may have negative side effects so before you buy, make sure you find out if it is really safe. All our lives we’ve been told safety comes first, it won’t matter if a supplement is effective if you’re not alive to reap the benefits. Another problem is that there are so many weight loss products on the market today how can anyone make a clear informed decision? I’ve got some great information from Web MD on over the counter and herbal weight loss products. Be sure to talk to your doctor before taking any of these over-the-counter drugs or herbal remedies for weight loss, as some could be a waste of money, or worse, dangerous. Ephedrine can cause high blood pressure, irregular heartbeat, insomnia, nervousness, tremors, seizures, heart attacks, strokes, and even death. Ephedrine can also interact with many prescription and over-the-counter medications. St John’s Wort has many potential harmful interactions with antidepressants, birth control pills, blood thinners, heart medications, and dextromethorphan (contained in various cold remedies). 5-hydroxytryptophan (5-HTP) In larger doses, 5-HTP may have a negative effect on the liver. Aloe: Use of this agent orally has lead to side effects such as abdominal cramping, diarrhea, and problems with the body’s mineral balance. In addition, it can interact with medications such as Lanoxin (digoxin), a medicine used to treat heart failure. Cascara. Use of this agent orally has lead to side effects such as abdominal cramping, diarrhea, and problems with the body’s mineral balance. In addition, it can interact with medications such as Lanoxin (digoxin), a medicine used to treat heart failure. Glucomannan-containing products have been banned in several countries due to the high incidence of gastrointestinal obstruction. Keep in mind that herbal preparations will not provide permanent weight loss and there are multiple ingredients in herbal weight loss preparations, some of which have serious side effects and can lead to dangerous toxicities. The diet industry is a multi-trillion dollar industry. They target people who buy various supplements that promising a body like a Victoria’s Secret model within a few months. All we supposedly have to do is take two pills a day or drink a powder based shake every morning and afternoon and before we know it, the pounds will melt away effortlessly. Sound familiar? In reality however, this is not the case. Have any of you ever read the small print beneath these outrageous claims? If you haven’t, I’ll tell you roughly what it says; “Individual results will vary. Weight loss is subject to diet and exercise and/or individual effort.” Weight loss supplements may have negative side effects and some are downright dangerous. The bottom line is that the only safe and proven effective weight loss strategy is proper diet and exercise. “How do you get a couch potato to exercise?” It sounds a little bit like a joke right? Leave a trail of bacon for them to follow? No the answer is “gameification”, another mysterious word that refers to making the weight loss process more like a video game. With that in mind lets find out what Forbes Magazine has to say in this feature all about Keas’ new health oriented social gaming project. Social gaming company Zynga has tapped into human psychology to figure out what triggers encourage people to play their games over and over again. They’ve also figured out what gets people to bring in as many of their friends as possible. As a result, Zynga’s users play for 2 billion minutes per day. But can these psychological triggers be applied in other vertica ls by using social media? The question I’m interested in is: to what extent can companies get people to do things they otherwise don’t want to do? If they can, that’s a powerful thing. Let’s look at the example of health. Americans have an obesity problem – it’s no secret. And health care costs are out of control. How can we get people to eat better and get some exercise? What’s harder to get people to do than exercise and eat better? Startup Keas, a social network with game mechanics, is tackling this problem. Keas is a website that employees use in the workplace. They get points, badges and achievements for completing tasks, and support their coworkers in their achieving their goals. People don’t cheat because they don’t want to hurt their reputation. Adam Bosworth, formerly of Google Health, started Keas to help the couch potatoes. Not the marathon runners or triathletes, but the average out-of-shape people, the “real people.” A full 1/3 of Keas users are overweight, 1/3 are obese and 1/6 are morbidly obese. In other words, only 1/6 are not overweight or obese. That gives you a sense of the challenge Keas is attempting to overcome. I asked Bosworth how does Keas get people to do something they don’t want to do, i.e. exercise? There are three ways, he said. Gaming giant Zynga says the power of gameification to get people to do what they normally resist needs to be explored more thoroughly. Click here to read more on how you get a couch potato to exercise. Long term natural weight loss is not a fantasy. Long term natural weight loss is not a fantasy even though every day we hear doctors report that obesity is on the rise in the U.S.. When I heard about Rick Salewske in the I felt inspired to share his story with others. Rick lost 300 lbs. over 10 years ago and continues to keep it off. Can you imagine going from over 500 lbs to 262 lbs. and then keeping it off for the rest of your life? A man who had a 68-inch waist and lost 300 pounds over the course of two years has managed to keep it off for a decade. Rick Salewske, 49, used to weigh 538 pounds. Today, he is half the size he was, and he’s married with children. In 2000, Salewske’s boss paid for him to go to the Cooper Clinic to lose weight. When the money stopped, Cooper picked up the expenses so he could continue on his weight-loss journey. Cooper said Salewske’s success has lessons for anyone trying to lose weight. Salewske is so disciplined that he hasn’t had ice cream, his biggest weakness during his days of extreme weight, in 12 years. “I’m afraid of it,” he said. His discipline extends to his workout routine, too. Four days per week, he runs 2.5 miles at lunch and rides a bike for 30 minutes after his children go to sleep. He also adds basketball and time on a StairMaster to his fitness regimen. However, Jay Ashore, clinical director of the Behavioral Health Center at Baylor Regional Medical Center in Plano, said there are genetic, biological or psychological factors that can make weight loss a tougher struggle for some. “What I don’t want to do is send false hope,” he said. Ashmore knows Salewske from his days at the Cooper Clinic, where he helped him manage his weight. He said Salewske’s resources at Cooper gave him an advantage others may not have. But Ashmore also said that the lifestyle changes that worked for Salewske are proven in the National Weight Control Registry, a database of 10,000 people who have lost a lot of weight and kept it off. Salewske recently weighed in at 262 pounds – 25 pounds more than he’d like. “It’s better than 538,” he said. Long term natural weight loss is the best way to gain confidence and improve self esteem. Even though you may not have the resources that Rick did you don’t need a lot of fancy machines to reach your goals, you need to believe in yourself. How EFT or "Tapping" leads to natural weight loss success. More people are learning how EFT or “Tapping” leads to natural weight loss success. The Emotional Freedom Technique has been used by millions of people to change bad habits and negative ways of thinking that are not productive. It’s a simple, painless and effective way to open new channels in the brain which allow for new ways of thinking. The article by Kimberley Willis published in the Independent Woman introduces the concept of EFT and why it is important to change your thoughts if you want natural weight loss success. Yes, that is what needs to be done. It’s so easy to say, less easy to do. I am a therapist and my job is helping people overcome whatever it is that is keeping them overweight, using a number of techniques including hypnosis and EFT (Emotional Freedom Technique or tapping). I am usually a dieter’s last resort. It’s great to start off with such low expectations! But I know that I can help them to feel more confident, teach them how to overcome cravings, deal with past issues and feel motivated to exercise more and to become slimmer and healthier. I listen to people’s stories and help them to identify what is really stopping them from breaking the chains attaching them to that excess weight. Part of my drive to help people comes from the fact that I lost a close relative to the effects of long-term obesity and it’s something that I want to help prevent happening to other people. The reality is that people know what they need to do — they just need the help and support to do it. I don’t include a diet plan in my book because what might suit one person won’t suit another, so I leave people to choose the way they want to proceed with their diet. It might be a plan or just healthy eating. Whatever they choose, I want them to be able to make positive changes that will last a lifetime and not walk a diet tightrope which they will fall off, leaving them feeling as if they have failed. So much of dieting is negative, but it doesn’t have to be. You can feel positive and still lose weight; your weight-loss journey should be a positive path, not one full of guilt and feelings of failure. One of my clients recently said that it was so strange to be feeling happy and positive and still lose weight. If you are feeling positive, you are more likely to achieve and maintain your goal. Everything we are and everything that happens can be traced back to the way we think. Our thoughts create our reality and if the thoughts are negative so will the reality that you create for yourself. You can turn things around with this simple technique. You have much more power than you think you do, learn how to use it by learning how EFT or “Tapping” leads to natural weight loss success. Current weight loss predictions are way off point. One new study performed in Bethesda Md. has determined that the current weight loss predictions are way off point. A pound a week was considered normal weight loss but when rate of metabolism was factored into the equation a whole new picture emerged. Along, with a whole new formula for figuring out what an average person should be eating in order to lose weight. In the past, physicians assumed that eating 500 fewer calories per day would lead to about a pound of weight loss per week, said Kevin Hall, a researcher at the National Institutes of Health in Bethesda, Md. But it turns out, this rule of thumb is wrong, Hall said, because it doesn’t take into account that metabolism slows down during dieting. Thus, predictions that used this rule were overly optimistic, Hall said. Hall and colleagues have developed a model that takes into account an individual’s age, height, weight and physical activity level to better predict how much weight they might lose on a diet and exercise plan. Currently, the model is intended only for use by physicians and researchers scientists, Hall said. Hall’s research has also come up with a more realistic rule of thumb for weight loss. The new rule says you need to cut 10 calories per day from your diet for every pound you want to lose over a three-year period. 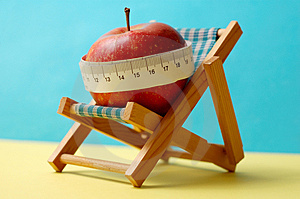 So cutting 100 calories per day will lead to a 10-pound weight loss over three years, Hall said. Half of this weight loss would occur over the first year. To lose more weight after the three-year period, you’d have to cut more calories, Hall said. The model may help policy makers understand the impact of public health measures on the obesity epidemic. For instance, one estimate of the effect of a 20 percent tax on sugar-sweetened beverages predicted that such a tax would lead to a 50 percent reduction in the number of overweight people in the United States in a five-year period. Hall ‘s new equation predicts about a 5 percent reduction in the percentage of overweight people in five years, Hall added. The difference in those percentages is pretty clear yet I believe there will need to be a lot of additional research to confirm Dr. Hall’s results that claim the current weight loss predictions are way off point. Are you and your family trying to eat more foods in their natural raw state? Obviously you are not going to eat raw chicken but this type of diet is high in fiber and low in fat. Watch the video recipe for low fat Thai chicken lettuce wraps that I came across today. This is a simple and tasty way to get protein and more vegetables into your meals. I enjoyed this video recipe for low fat Thai chicken lettuce wraps because even if you don’t have much time to cook you can create something delicious and healthy in a few minutes on a limited budget. Yum! Bon Appetito! Natural weight loss with the ancient paleo diet. We are always looking for fresh new ideas for faster and easier natural weight loss. With the ancient paleo diet the new idea is actually an old one. The main focus is on eating more whole foods and fewer processed foods. Some people confuse the paleo diet with the raw diet because they assume cavemen didn’t cook their food. It’ s true there is a greater percentage of raw veg in the paleo diet but there are many cooked meals and recipes for the paleo diet. Read more from My Sassy Chef on natural weight loss with the ancient paleo diet. A diet that is environmentally friendly is what we are all looking to have when we put on our meal planner hats. There are many places like organic food shops and farmers markets that help make these foods more accessible to the average person. However, whenever you think about this kind of diet, imagine less meat and more nuts, beans, vegetables, and grains. This image of the diet has created a culture which turns to low-fat high carbohydrate foods with increased fiber and less meat. If this is the way society is going, then why are we seeing record highs in pork demand? Why are bacon and pulled pork sandwiches the staple on most menus if it goes against the beliefs of environmentally conscious eaters? “Paleo Diet for Athletes” by Loren Cordain and Joe Friel shows us that even American athletes are eating incorrectly. They state that athletes are not eating enough fresh fruit, seafood, vegetables, and leans meats, but rather taking in too much refined sugar, cereals, and dairy products. Cordain and Friel do present a host of evidence that supports their argument. The anti-vegetarian sentiment and the authors’ apathetic view towards organic food has been attacked by many eco-friendly consumers. However, there are also some vegetarians and eco-friendly consumers who are taking a look at what this diet is promoting. Many of us have promised ourselves and our loved ones that we will shed some pounds this year. Some of us may have made that same promise many times before without the desired results. That doesn’t mean we should just give up. Using simple strategies for successful natural weight loss you can achieve your goals. The top weight loss tip is to drink more water. Drink at least 8 to 10 8 oz glasses of water daily. If you are physically active you may need more. Water speed up your metabolism which burns calories. Water also helps flush waste out of our system and helps us to digest our food to get the most nutrition out of the food we eat. If we drink water between meals it also makes us full so it helps avoid temptation. Drink Plenty of Water. Soda is full of sugar or artificial sweeteners that have no nutritional value. Soda, diet soda and all commercially processed drinks are full of sweeteners or preservatives that help us gain weight. The suitable alternatives are water and natural tea. Choose Green Tea, Oolong Tea, Pu-er Tea or any tea. Tea has no calories or preservatives. Limit the amount of sugar you add. Fresh Vegetables add many vitamins, minerals and nutrients without adding many calories. Try the half plate method. Fill at least half of your plate with vegetables. The balance of the plate should be low fat protein and a carbohydrate like rice, pasta or potato. Ideally you want to eat 60 to 70% of your diet as fruit and vegetables. So if at least half of your lunch and dinner plate is vegetables we are getting there. Additionally, you can choose beans over meat sometimes. If you choose meat, choose lean meat. For your carbohydrates choose whole grains for rice, pasta, or breads. Sugar of course is the number one thing we consume to gain weight. Limit it or eliminate it. Choose Truvia or other calorie free sweeteners. Choose mustard over mayonnaise. Choose oil or vinegar based dressings verses the creamy salad dressings. Limit the amount of dressings you add to you salads. Instead of eating bakery snacks or chocolate and candy snacks choose fruit, vegetables and nuts. Not only are they healthier for you but they will help you to lose weight. To do this you must be prepared. Have the snacks available at home and at work. When you shop avoid the cookies, cakes and candy sections and purchase healthy fruit and vegetables and nuts. Two are always better than one. When one is week the other is strong. Choose a weight loss buddy to encourage you and some one you can be accountable to. It is good if they are also living a healthy lifestyle so you are on your weight loss journey together. We live sedentary lifestyles. most people only get exercise when they establish an exercise program. To speed up your weight loss we need to consciously move. Walk when we can. instead of calling someone in the office walk to their desk. Instead of shouting to your spouse or kids walk to them. Be aware of your movements and increase your daily activity as much as possible. One pound equals 3500 calories. If we are diligent in following these 7 tips and can reduce our calories by an additional one pound a week we will speed up our weight loss. These tips are not the weight loss program they are additional tips to help speed up our weight loss. You are the only one who can achieve your weight loss goals, however it makes a big difference if you have a support system to keep you motivated. Your chances of success increase if your friends and family don’t sabotage your efforts. Keep these strategies for successful natural weight loss in mind as you continue on your weight loss program.